In the past we know the Falling Wedge pattern, then now we will understand his friend, namely: Rising Wedge. 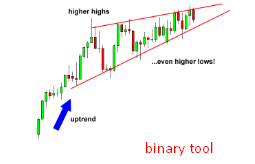 What is the Rising Wedge Pattern? And how to identify these patterns in the market? This article will immediately provide you with an illustrative example of how to identify reversals in market trading. Let's look further at the review. Contrary to Falling Wedge, the Rising Wedge is a chart pattern that indicates a trend reversal, where before the reversal, the resistance and support lines show a narrowing or consolidation pattern. This consolidation pattern is the initial indication of a possible reversal pattern. Here, the slope of the support line is steeper than resistance. With the price consolidating, we know that a big explosion will come, so from this chart pattern we can expect prices to run either up or down. The new Rising Wedge pattern can be confirmed after a breakout at the support breakdown. Thus a trend reversal pattern occurs from bullish to bearish. 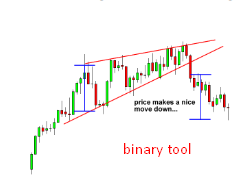 The Rising Wedge pattern is one pattern that is difficult to recognize accurately. Even though the Rising Wedge chart formation gives a picture of price consolidation, there is no upside momentum at every high point formed, making this chart pattern biased towards the bearish trend. This chart pattern is named Rising Wedge (rising = up, up; wedge = wedge, clamp, head ax), because the lines of resistance and support drawn show a narrowing pattern that moves up. A rising wedge is formed after up-trends tend to cause reversals. 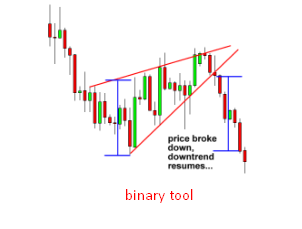 While the rising wedge is formed during the downtrend it is usually a continuation of the down-trend. Simply put, if a rising wedge leads to a downtrend, which means that it is a bearish chart pattern still continuing!